Thats what I like about racing. Its a chance to throw off the shackles of training, daily life, bills, whatever and dig so deep it hurts. This past weekend I took part in round 2 of the Enduro Series in Val D’Allos. Its said to be the best and hardest of the series. From some of the headcam stuff I had seen it certainly looked good. Big mountains with bigger mountains in the background in one of my favorite parts of the world combined with three of my bestest buddies meant the cards were stacked. We went and signed up and took a walk of a tiny bit of the course. We were 4 VERY excited individuals after seeing the track. Looked so much fun. Mats and Chris spotted people on Mud tyres and went into a frenzy of doubt..Mats cut a spike down and set his rig up. Chris, after a lot of umming and ahhing, did the same. Steve had to ban all talk of Duometer, tread pattern and give stern looks to them both later. Steve and I, being sensible went with All round tyres. 6am came round and The Swede was up, had his back protector on and was keen as mustard. KEEN! Loaded up, Superstar Cowboy coffee and on the road. It took us about a minute on the lift to see it was bone dry. Oh how we giggled at the Spike boys! All the way to the top of the mountain with glimpses of race tape. We watched the fast boys go off. This was BIG mountain and fast as hell singletrack. Nothing really tech but just great, great singletrack. Special 1 again. Armed with knowledge we attacked the trail again. More perceived memory of the track gave rise to some close moments indeed. On the edge is where its at but not over the edge. 40 secs knocked off that time so good show but you immediately feel the effort on the second run. The Attrition starts. New stage starts. Off the other direction and down a fast as hell ridge. 40mph I reckon. Then into the best trail. Check the headcam to see Headley chasing me. The clouds darken and a HUGE storm rolls in and rain comes DOWN. Luckily we aren’t stuck up the mountain like the others. Unluckily we don’t get to race anymore on the day. I am gutted. Displeased with my 85th place this is where I want to start reeling in the time…what can you do? A beer, some food and sleep and bring it the next day. Rain fell late but its bluebird in the morning. Less keen Sweden and the rest of the team are tired. Strength will be needed for today. Upto the top and we see the first part of the course. It looks bad. a 2-3min climb up a ridge at altitude. Ouch. We rush off to get a good warm up. I go off and I go quick. Get to the climb and I beast myself up it. I don’t have much choice as I am pushing a 36 single ring but I go hard. I reach the top and am in agony, come round the corner to some very difficult, off camber singletrack into the Scree slope. Tripoding at speed on a leg full of lactic was not fun but got down it, avoided most people walking it and onwards. We had to do this another 2 more times! 2nd run was much, much better physically but rode it bit badly and the 3rd was well executed all round. Took the term ‘Exhausting’ to another level. Or that is what I have called it..I reckon that suffering in groups is good BUT you can’t come to that party with out preparation. This is the secret, dark preparation that I reckon the KGB would enforce upon their units to enable maximum pain infliction. Its a dark place. Hill intervals, 6 x 2 mins almost max, 4 x 1 min almost max (both seated) and then 2 x 30 secs full on max (out of saddle). All with 2 mins rest between…Its incredible how quickly 2 mins can pass. I was wondering if I’d be able to make 6×2 mins after the first one but I did as I realised I might have been going a bit hard. The 4×1’s were hard…acid burning and then the 30 secs max. The first was okish (that is relative) but the final one had me screaming, grunting and generally baring resemblance to something not of this earth. Pretty happy to have those finished I have to say…. Now, where is this party? Thats what I’m doing and to be honest its driving me a bit mental. I am so used to/addicted to having my daily fix of sport supplied endorphines I am getting a bit craggy. Luckily my dear girlfriend is away so doesn’t have to put up with my moods. Its so bad I loved every minute of a 25 minute turbo session this morning. Wacko. I don’t think it is being helped by having another partner in Endorphin fuelled crime encouraging the obsession. Jerry is doing the La Marmotte sportive cyclo race and has hit full term training. Sharing his pain/joy with me at any point. Today I would normally be undertaking a good, solid road ride but NOOO. Tapering. I am jealous that he’ll be sweating away into the horrendous bise (northery wind), feeling the attritional acidic burn up into the Jura, getting a bit giddy, getting cold….I miss the B&W romantic image of it all. And then there is Graeme..
My time will come this weekend. However, another sickness is growing. I’m not sure where its come from but I have a desire to get a proper XC hardtail and race it. How? Where? When? Who knows. I can only imagine what it must have been like to have got the puncture, push for hours, nearly get hypothermia but turn around and get it done! Incredible! He is one sick puppy! Paul Errington. 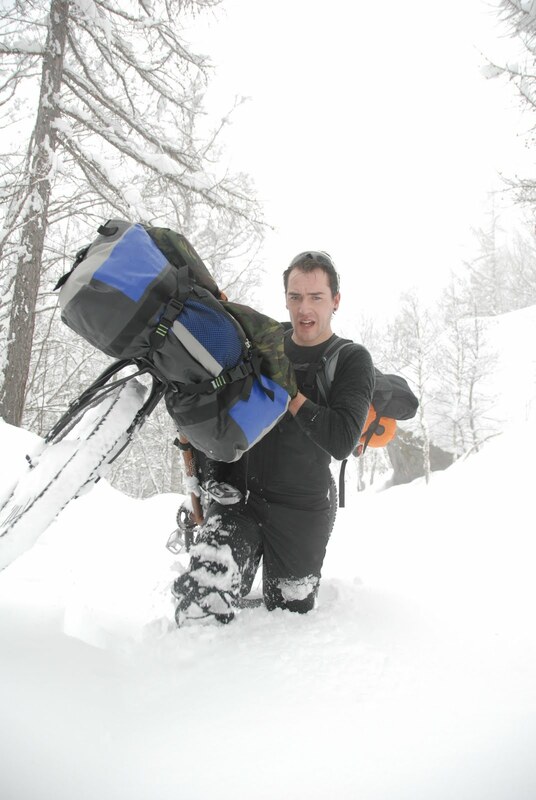 To ride, push and wade through snow is ok for the thrill of the descent but for nothing other than pushing it back down. I like the cut of your jib sir!